IE6 is ten years old and is the most used web browser ever created. Ten years ago, when websites looked like this IE6 was a strong alternative to other available browsers, such as the all too ubiquitous AOL service, whose CDs we all saw littering the streets back then. At that point, the internet had recently become a critical component of business operations and commerce. As a result, in addition to it’s wide adoption by the public, IE6 was customized and integrated into the network operations of many major corporations. Billions of dollars were spent to made IE6 a critical component to how businesses operated. And Microsoft, making millions on licensing fees, and with their typical lack of foresight, facilitated this wholesale adoption and integration of IE6. The problem that became apparent within just a few years was the fact that these corporations had no intention of investing more millions to adapt their internal networks to an updated browser. And the public seemed equally hesitant to switch, with Microsoft doing little to promote the notion that regular updates should be expected and installed. As a result, IE7 went nowhere. When IE7 debuted in October of 2006, people simply didn’t switch. Businesses didn’t want to invest the money and the public saw little benefit as the internet hadn’t matured to the point that browsers required any significantly different technology. But not IE6. 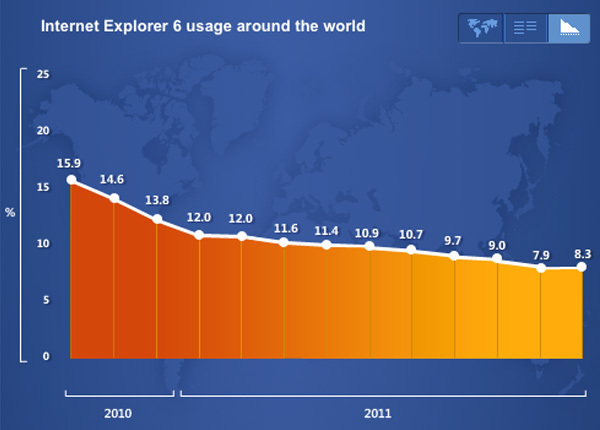 As you can see in the graph above, as of only a year ago a good 12% of people online were still using IE6. That means that they weren’t seeing most of the web the way it has been designed. And who suffered for this lack of adaptation? Businesses were significantly impacted as the design and development they could employ was greatly limited. Also, the public, only able to view a rudimentary, square, less functional version of the internet totally lacking in subtlety. But most frustrated by this lack of forward movement were web designers and developers. Not for lost wages. No, IE6 browser testing can be very time consuming, if quite frustrating. Designers and developers suffered for knowing that much of their understanding and experience with graphic design, usability, and promotion was totally wasted on some fairly large minority of people looking at their work. Comparable to being a musician and knowing that most people are listing to your music through cheep ear buds. This basically meant that designers and developers had to stifle their creativity and know-how for the sake of reaching the widest audience, and that has for many years held back the potential of the entire internet. Well, Microsoft has FINALLY indicated that the end is near for IE6 with an upcoming integration of automatic updates, a feature you will find on every other browser. With this feature Microsoft has indicated the intent to minimize IE6 usage to below 1% of market share. While this is a welcome change, many are frustrated, wondering what took them so long. Those familiar with Microsoft know that the corporation has a culture of derivation and not innovation and is simply following the leader at this point, always a couple years behind the forefront. But whatever the motivation, businesses and developers all over the world are sharing a collective sigh of relief that this very outdated technology is finally being phased out.